FLAT is a short first person, ice skating combat game initially made for the 7 Day FPS Challenge and released under the GPL. FLAT uses the Allegro game programming library, and is playable on Linux, MacOS, Windows, and Open Pandora. For more up to date information, see the FLAT repository on GitHub. 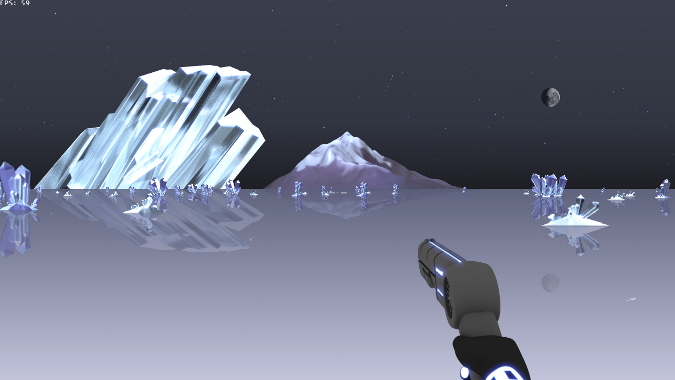 FLAT was initially created for the 7 Day FPS Challenge in June 2012. Johan "SteelRaven7" Hassel, Josh "Cheeseness" Bush and Johannes "jo_shadow" Peter worked a grueling schedule to get the game playable from scratch within a week. With little sleep and less time to spare, they released a playable build of FLAT, which, while still rough around the edges, was enjoyable and challenging. In the week following the 7DFPS event, Cheeseness added additional features, art assets and gameplay fixes to make a more polished "post-7DFPS" build available. Cheese also worked with composer Anton Riehl, who had offered to write a score for the game, and implemented a simple context sensitive music system. Blogs during this period of development can be found towards the bottom of the FLAT profile on the 7DFPS website and Cheese's blog post on twolofbees.com. In July 2012, SteelRaven7, Cheeseness and jo_shadow decided to release FLAT under the GPL in order to make it more accessible and give others the opportunity to learn from or improve the game. Remaining todo list items were added as "issues" to indicate the planned direction for the project. Cheeseness continues to monitor and review pull requests (contributions), and hopes that someday, he'll have time to work on FLAT again.